Having looked back on my recent posts I have noticed that they are all from a similar colour palette. Easy to tell that it is a palette that I am comfortable with and tend to move towards naturally. So for this post I thought I’d try something a little more adventurous colourwise for me. How about using some of the new In Colors, in this case Tranquil Tide and Lemon Lime Twist. The Lemon Lime Twist is quite a bold colour and I wasn’t sure I liked it to start with, but it has grown on me and pairs beautifully with Tranquil Tide. To create this card I started with water colour paper and an aqua painter to gave it a light covering of Lemon Lime Twist which I then left to dry. While I do intend to purchase a Lemon Lime Twist re-inker, I don’t have one a present. As an alternative I gently squeezed the closed inkpad so that some ink tranferred onto it’s lid and then used the aqua painter to pick up colour and tranfer to the water colour paper. This resulted in a lightly water washed effect on the cardstock. 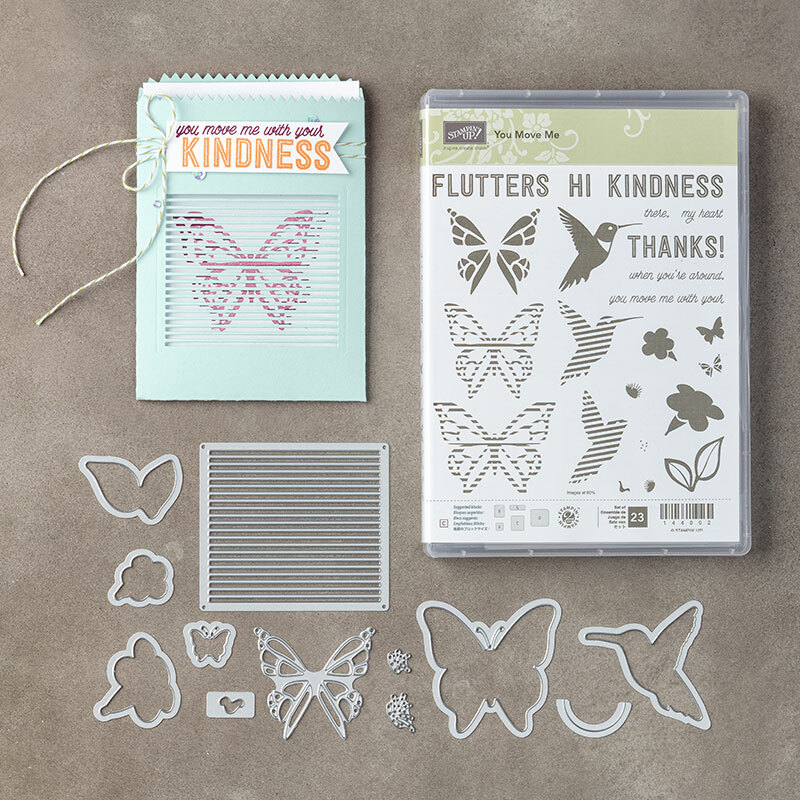 The larger butterfly has been die cut from Tranquil Tide cardstock using the new Move Me thinlits and painted with Wink of Stella Glimmer pen for that touch of bling. The smaller butterflies were 2 step stamped on Whisper White using the new stampset You Move me and then also die cut. The greeting is from the Work of Art Stamp set. All of this was mounted on Tranquil Tide cardstock and a Lemon Lime Twist cardbase. The You Move Me stamp set and Move Me thinlits are intended to be an interactive set. As you move the butterfly or humming bird up and down, it appears to fly. This can be seen in the video HERE. As a bundle you can save 10%.